There will still be "Division 1" and "Division 2" playoffs, but teams must no longer play against same-division opponents to qualify for them. 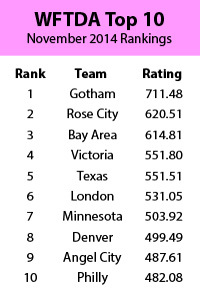 The WFTDA has released its post-playoffs rankings, and Hydra winner Gotham remains the #1 team in the world, followed by Champs runners-up Rose City. The rest of the top 10 remains unchanged from the last update, and only two pairs of teams swapped places in the top 25. This effectively dissolves the three divisions setup by the WFTDA in 2013. In the system, the top 40 teams ranked by the organization after the playoffs were considered Division 1 teams. The next 60 teams after that were placed in Division 2, and everyone else ranked outside the top 100 was labelled Division 3. Click for full and current WFTDA rankings. It was a setup that caused some confusion, since the point at which a division assignment was made for gameplay requirement purposes was completely different than the point at which a division a team was assigned to for tournament play. The removal of division designations will not affect who will get into the playoffs, however. The top 40 ranked teams will still qualify for the “Division 1” playoffs, and the next 20 teams for the “Division 2” tournament, even if the teams themselves will not technically be thought of as in those divisions during the year. This tweak comes hot on the heels of several others to the WFTDA ranking system. Two months ago, it announced that it would be eliminating the multiplier weights for tournament games to give every game equal importance in ranking calculations and not penalize teams that can’t get into the playoffs. Earlier this year, the WFTDA also changed how its ranking algorithm was calculated by using difference in ranking points, not difference in rank, to determine the Strength Factor variable. Previous changes appear to have made it much easier for teams to find matched opponents, resulting in closer games. Removing the requirement to play against similar opponents may mean teams going after lesser opponents for a rankings boost more often, but the other changes made to the algorithm may help discourage that. As it always is with the WFTDA, time will ultimately tell if these changes will work out as desired. Hope you ex-D2 teams have the budget to play and/or travel to another game next season.